Both the 2019 Volkswagen Jetta and the 2018 Mazda3 offer some pretty incredible features and capabilities, making both a good pick for sedan shoppers in the areas of Irving, Grand Prairie, Grapevine, and Dallas. How will you be able to choose between them when you’re on the hunt for your next sedan, you ask? In an attempt to remedy that question, we at Metro Volkswagen have created this detailed comparison. Read ahead to see how the VW Jetta and Mazda3 stack up against each other when it comes down to performance, interior comfort, and technology! 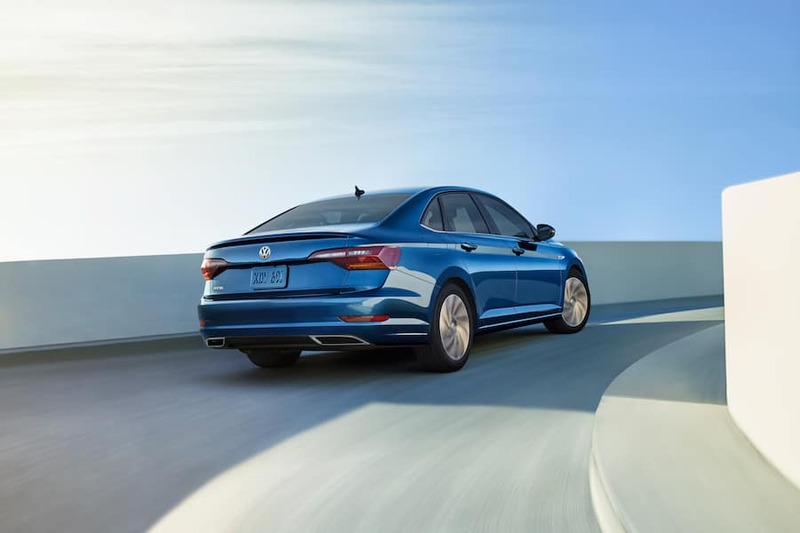 Leading the way in the 2019 Volkswagen Jetta is a 1.4L turbo engine that boasts the perfect balance of power and efficiency. This engine can be paired with either a 6-speed manual transmission or an 8-speed automatic transmission with Tiptronic® and Sport mode. Regardless of which one you go with, you’ll achieve an incredible EPA-estimated 30 city/40 highway MPG1while still putting out a peppy 184 lb-ft of torque. As for the 2018 Mazda3, you’ll have a 2.0L DOHC 4-cylinder engine. This non-turbo engine doesn’t offer quite as much pickup, with only 150 lb-ft of torque to offer in the standard trim. Additionally, the best fuel economy you’ll achieve is an EPA-estimated 28 city/37 highway MPG no matter what equipment you get in this model. Inside the 2019 Volkswagen Jetta, you’ll find plenty of space for both passengers and cargo. As per the standards of its sedan body type, the VW Jetta is equipped with five seats. However, this model goes above and beyond the standards with 37.4 inches of rear legroom as well as a whopping 14.1 cubic feet of cargo space in the trunk. The 2018 Mazda3 also sports five seats. Unfortunately, though, it isn’t quite as accommodating for passengers of all sizes. In the rear row of seats, you’ll only have 35.8 inches of legroom. Additionally, you’ll have just 12.4 total cubic feet of cargo space in the trunk, limiting what you can bring along. The interior of the 2019 VW Jetta isn’t just spacious and comfortable—it’s rich in advanced technologies as well. This model offers an intuitive Discover Media touchscreen navigation system with a large 8-inch display and an array of connectivity features. Standardly, you’ll get Bluetooth® wireless technology. You can also opt for Volkswagen Car-Net®, which lets you sync your smartphone and access your favorite apps right from the infotainment screen via Apple CarPlay™ and Android Auto™. The 2018 Mazda3 also offers a touchscreen infotainment system. However, the biggest screen you can get is only seven inches. Plus, this model doesn’t offer Apple CarPlay™ or Android Auto™, so you’ll have to wait until you get to your destination to take advantage of your smartphone’s many useful functions. 2019 VW Jetta vs 2018 Mazda3: Which One? As you can see, the 2019 Volkswagen Jetta offers the full package that drivers in the areas of Irving, Grand Prairie, Grapevine, and Dallas need. Now that you’ve had a taste of what this sedan can do, it’s time to get behind the wheel. Give us a call at Metro Volkswagen today to schedule your test drive!